Solanum aviculare is known as the Kangaroo Apple and is a small to medium spreading shrub. In our cold climate garden plants usually reach a maximum height of three metres. The leaves may be entire or lobed, up to 30 centimetres long, deep green above and lighter green beneath. Our specimens have lobed leaves. Flowers are up to four centimetres across and an eye-catching bluish-violet with a deep violet star-shaped marking at the base and bright yellow anthers. Spring and summer are the main flowering periods when blooms are both profuse and conspicuous. Sporadic flowering occurs at other times. Egg-shaped berries about two centimetres long follow the flowers. Initially they are green then age to orange-red. Both flowers and berries are visited by insects and birds. Native bees visit the flowers and aid fertilisation by buzz pollination. The bees sit on top of the anthers and vibrate their wings. This causes pollen to lift out of the upright anthers and adhere to the bees’ bodies. The pollen is carried to other flowers and cross pollination takes place. Tomatoes, also in the Solanum family, are also buzz pollinated. Birds feed on the berries and spread the seeds. We always have some Kangaroo Apple seedlings appearing in our gardens. They are useful plants as they shelter more delicate plants until they are established. Solanum aviculare is a fast growing shrub. Plants are said to have a life span of from five to six years. In our cold climate garden, they have a life expectancy of about four years. This is not a problem as we always have a range of self-sown plants at various sizes and ages in the garden. 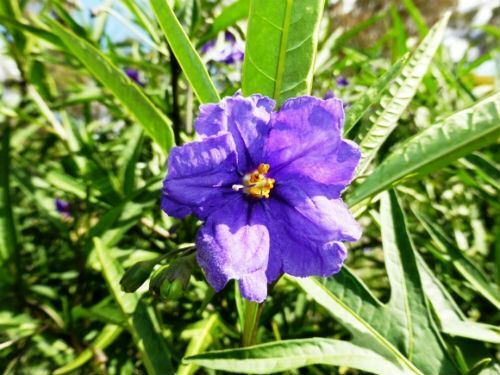 Solanum aviculare is widely distributed and is found not only in the eastern areas of Queensland, New South Wales and Victoria but also on Lord Howe Island, New Zealand New Guinea, Lord Howe Island, Norfolk Island and New Caledonia. The Kangaroo Apple may be extinct on Norfolk Island. The species may also be naturalized in South Australia and Western Australia. In New Zealand, the common name is Poroporo. Solanum aviculare is not only interesting horticulturally but also medically. Young foliage and unripe fruits contain steroids which are used as raw material for contraceptives. The species is cultivated in Russia and Hungary for this purpose. Plants are also used as a rootstock for grafting eggplant. Propagation of Solanum is from seed and cuttings that strike rapidly and enthusiastically.